Skovby was founded in 1933 by cabinetmaker Thorvald Rasmussen. With vision, strenuous effort and professional pride he created a foundation for sustainable and functional furniture design, which his son Villy Rasmussen and grandsons Preben and Jørgen Rasmussen, have carried on ever since. The driving force, and a shared passion spanning the three generations of cabinetmakers, is function. The continuous and direct reason for Skovby’s success is due the ability to develop designs, which unite strong aesthetic expression with innovative function. 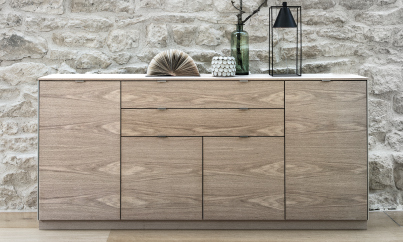 Skovby provides reliable products that are made of beautiful woods such as walnut, cherry, oak, and teak. Skovby dining tables, sideboards and hutches, along with their unique seating options, will make your home look spectacular!